Chronic infantile neurological cutaneous and articular (CINCA) syndrome1 is a rare, genetic autoinflammatory disease that belongs to the spectrum of cryopyrin-associated periodic syndromes (CAPS), along with the familial cold autoinflammatory syndrome and the Muckle-Wells syndrome. CAPS are associated with autosomal-dominant mutations in the NLRP3 gene (formerly CIAS1), which encodes the protein cryopyrin2,3. Within the spectrum of CAPS, the CINCA syndrome, also known as neonatal-onset multisystem inflammatory disease (NOMID), is considered to be the most severe phenotype. 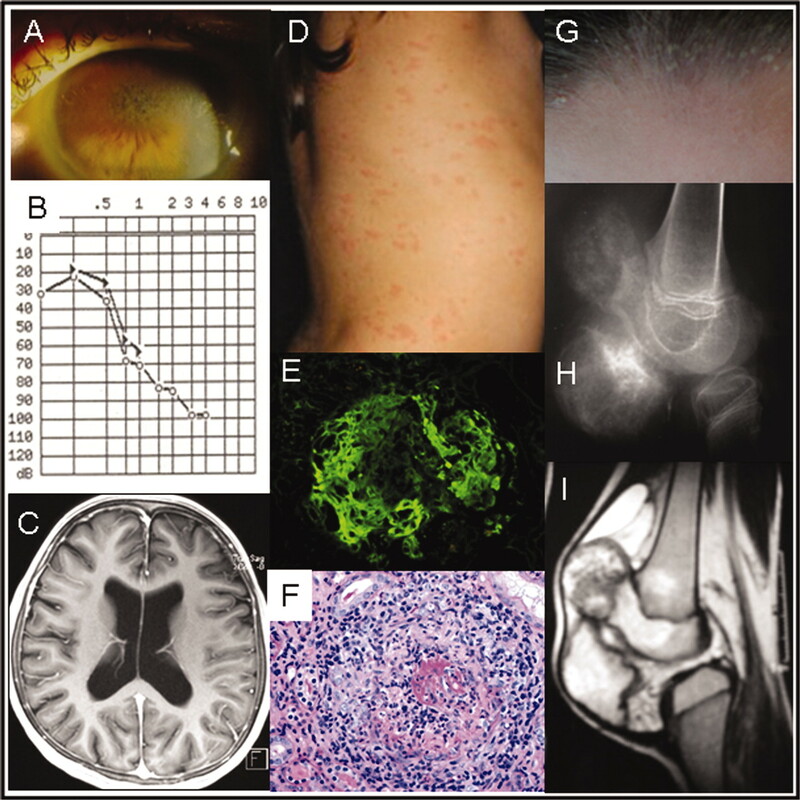 A triad of urticarial rashes, neurological manifestations, and arthropathy, accompanied by recurrent fever episodes and systemic inflammation, originally defined CINCA syndrome1,4. Systemic AA-amyloidosis is a serious longterm complication that can lead to renal failure and increased mortality4. We describe a 23-year-old Caucasian woman who had developed urticarial skin lesions, lymphadenopathy, and recurrent febrile episodes within the first week after birth. The persistent nonpruritic and migratory urticaria were most pronounced at the patient’s face, trunk, and lower limbs and would intensify during recurrent attacks of fever (Figure 1D). Acute-phase reactants were constantly elevated [C-reactive protein (CRP) up to 170 mg/l, serum amyloid A (SAA) up to 567 mg/l]. Failure to thrive, mild splenomegaly, and refractory iron-deficiency anemia, without a detectable source of infection, led to no definitive diagnosis, and an extensive investigation for autoantibodies and complement defects was negative. During early childhood she developed arthritis of both knees and excessive hyperostosis of the patella and distal femur (Figure 1H, 1I), which led to constant pain and finally required surgery. She developed bilateral chronic uveitis with secondary band keratopathy (Figure 1A) and optic neuritis, which led to a significant visual impairment with optic nerve atrophy. At age 5 years the clinical diagnosis of CINCA syndrome was made and later confirmed by genetic testing, indicating a novel NLRP3 mutation A439P. Short stature, frontal bossing of the skull, characteristic flattening of the nasal bridge, clubbing of the fingers and delayed closure of the fontanelles (at age 10 years) contributed to the clinical picture. Episodes of transient sudden deafness preceded bilateral sensorineural hearing loss, especially in the higher frequency range (Figure 1B), and brain magnetic resonance imaging showed diffuse cortical atrophy and ventriculomegaly (Figure 1C). Clinical features of CINCA/NOMID syndrome: (A) band keratinopathy; (B) sensorineural hearing loss; (C) hydrocephalus; (D) migratory urticarial rashes; (E) diffuse necrotizing glomerulonephritis with fibrin deposits and (F) mononuclear cell infiltration; (G) pustulosis; and (H, I) excessive hyperostosis of the patella and distal femur. At age 12 the patient developed a pauci-immune crescent glomerulonephritis with diffuse extracapillary necrosis and accompanying vasculitis without amyloidosis (Figure 1E, 1F). Renal function was stabilized by 3 pulses of cyclophosphamide 500 mg, but mild proteinuria and reduced creatinine clearance remained. An association of autoinflammatory diseases such as familial Mediterranean fever and vasculitis has been described5, but this is the first report of vasculitis in a patient with CINCA syndrome. Despite various treatments (including corticosteroids, azathioprine, methotrexate, mycophenolate mofetil, and cyclosporine), persistent uveitis, polyarticular arthropathy, and patellar overgrowth continued to be major complaints, temporarily confining the patient to a wheelchair. She suffered frequent episodes of headaches related to chronic aseptic meningitis. Treatment with a soluble tumor necrosis factor (TNF)-receptor immunoglobulin fusion protein (etanercept, 50 mg weekly) or with a monoclonal antibody against TNF-α (adalimumab, 40 mg subcutaneously biweekly) led to mild improvement of symptoms but no reduction in CRP and SAA levels. An advanced understanding of the pathophysiological mechanism and consequences of NLRP3 mutations indicated a pivotal role of interleukin 1ß (IL-1ß)3,6, and new treatment modalities became available. At age 17 years the patient was treated with the IL-1-receptor antagonist anakinra (100 mg subcutaneously daily), which significantly improved all symptoms and completely normalized CRP and SAA levels for the first time7,8. After a few months, she presented with sterile pustulosis on her scalp (Figure 1G), which spontaneously disappeared 8 weeks later. However, despite satisfactory disease control, daily anakinra therapy was discontinued because of severe local pain at the injection sites. A trial of the anti-IL-1ß monoclonal antibody canakinumab was equally effective, but anakinra was finally restarted upon the patient’s request. She believed that she benefited more from this medication, and no local reactions were observed at that time. Because of frequent headaches and chronic uveitis especially during winter, anakinra was intermittently elevated to 150 mg subcutaneously daily, with improvement of symptoms. Now, at age 23 years, the creatinine clearance is 30 ml/min with a serum creatinine level of 1.2 mg/dl. Two episodes of acute-on-chronic renal failure occurred during a bout of gastroenteritis and exsiccosis and during a severe exacerbation. The patient took low-dose angiotensin-converting enzyme inhibitors for nephroprotection. Several transient episodes of sensorineural deafness resulted in a permanent but mild hearing deficiency but a hearing aid is currently not required. Laser cyclophotocoagulation was performed to reduce the constantly elevated intraocular pressure to a normal range. Interestingly, a concomitant fibromyalgia syndrome seems to be unrelated to inflammatory disease activity. Our patient shares many common and less-frequent manifestations of CINCA syndrome, such as renal involvement other than amyloidosis. The occurrence of glomerulonephritis and renal vasculitis extends the spectrum of the disease. Our case contributes to the few reports on adult patients with CINCA syndrome9,10. Patients with CINCA and related syndromes are a challenge for the clinician, requiring an early diagnosis, initiation of an IL-1ß-blocking therapy, and careful interdisciplinary followup to prevent permanent organ damage. The authors thank Prof. Dr. R. Waldherr (Heidelberg) for providing the histopathological images and Dr. J. Grulich-Henn (Children’s Hospital at the University of Heidelberg), Dr. B. Rogalski (Pediatric Rheumatology, Bensheim), and our colleagues from the German Centre for Rheumatology in Children and Adolescents (Garmisch-Partenkirchen).
. Arthropathy with rash, chronic meningitis, neurological changes and arthritis. J Pediatr 1981;99:79–83. Chronic infantile neurological cutaneous and articular syndrome is caused by mutations in CIAS1, a gene highly expressed in polymorphonuclear cells and chondrocytes. Am J Hum Genet 2002;71:198–203. De novo CIAS1 mutations, cytokine activation, and evidence for genetic heterogeneity in patients with neonatal-onset multisystem inflammatory disease (NOMID): a new member of the expanding family of pyrin-associated autoinflammatory diseases. Arthritis Rheum 2002;46:3340–8.
. A recently recognised chronic inflammatory disease of early onset characterised by the triad of rash, central nervous system involvement and arthropathy. Clin Exp Rheumatol 2001;19:103–6. Long-term efficacy of the interleukin-1 receptor antagonist anakinra in ten patients with neonatal-onset multisystem inflammatory disease/chronic infantile neurologic, cutaneous, articular syndrome. Arthritis Rheum 2010;62:258–67.
. NALP3 forms an IL-1ß-processing inflammasome with increased activity in Muckle-Wells autoinflammatory disorder. Immunity 2004;20:319–25. Familial Mediterranean fever (FMF) in Turkey: results of a nationwide multicenter study. Medicine 2005;84:1–11.
. Interleukin-1 blockade by anakinra improves clinical symptoms in patients with neonatal onset multisystem inflammatory disease. Arthritis Rheum 2005;52:1283–6. Neonatal-onset multisystem inflammatory disease responsive to interleukin-1 inhibition. N Engl J Med 2006; 355:581–92. Twenty year follow up of a patient with a new de-novo NLRP3 mutation (S595G) and CINCA syndrome. Klin Padiatr 2009;221:379–81.